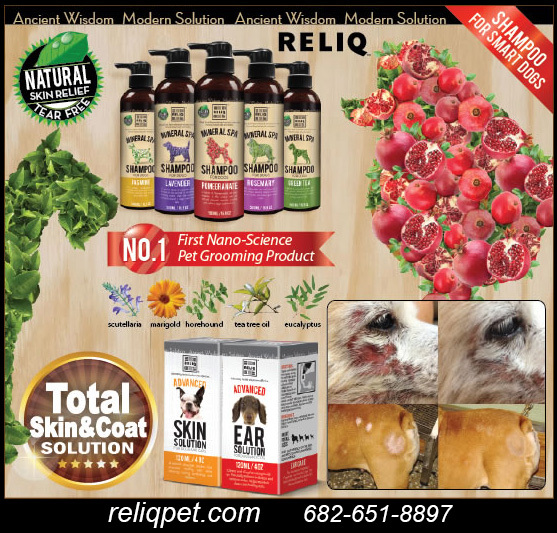 The Nano Technology used in Reliq Pet is so cutting edge and exclusive, that Reliq Pet is the first to introduce this incredible Shampoo technology to America. Try it just once and you'll never use anything else! How Did RELIQ Come To Be? RELIQ is a family owned business in Dallas, Texas. The founder is a technology and communications specialist with a family history in small businesses. Back in 2009, the founder recognized a personal need for better pet care products that were safe, environmentally friendly, and most of all, EFFECTIVE! He discovered that nearly all shampoos and odor treatments from big box store products to expensive boutique products—simply masked odors without actually resolving the root cause of odor and skin problems. Through a lengthy, global search, he discovered a refined material element, originally intended for another use, that met the core needs he wanted for his loved Schnauzer, Rocky. With his formal education in biomedicine, the founder was skilled in directing additional refinements and customizations which eventually led to the final product formulas. The perfect solution for safe and effective pet care was born… RELIQ pet! So What Makes The Active Ingredients In RELIQ Products So Amazingly Different and Effective? This active ingredient is a special mineral found in a discreet volcanic region. The transformation of this mineral through Nano-technology science has created a game-changing, effective solution to cleaning animal skin and maintaining healthy follicles. So Why Does RELIQ Offer Such Amazing Results? Unlike chemicals in other pet products that merely mask the odors, the RELIQ skin and coat cleansing process actually removes the bacteria and toxins—the root source of the odors and skin problems—through an absorption process. The formula continues working by stimulating the skin and attracting oxygenated blood to damaged skin cells, revitalizing the complexion and tightening the pores. This healing ingredient is exceptional at cleaning the coat and skin, and it performs better than any other existing product while also clearing problem skin, hot spots, and odor problems that is often so prevalent with unhealthy skin. Why Was "RELIQ" Chosen As The Company Name? Both the name and process of RELIQ is a combination of the old world Relic minerals found in our Earth combined with the latest smart IQ Nano-technology science. RELIQ. The RELIQ line includes Shampoos, Odor eliminators, Paw spa creams, and Ear & skin care solutions, and all can be successfully used in both the home and by professional groomers. What Can I Expect From RELIQ Shampoos? - Groomer friendly formula - no more blistered or dry hands after daily use! Why Is RELIQ Shampoo More Effective Than "Oatmeal" In Relieving Itchy Skin? Compared to oatmeal, enzyme, or any other traditional formula product, RELIQ is more effective in relieving itchy, scratchy skin and other skin irritations. RELIQ products are inherently easy to rinse and therefore promote water conservation, are natural and healthier, safer for the environment but most importantly, RELIQ Pet products work!!! What Is Nano Technology and How Does It Work? Nano-technology is a scientific process that breaks down core substances into smaller masses. The natural size of a volcanic mineral is about 1000-2000 micrometers. Our Nano-technology miniaturizes these key minerals down to 5-20 micrometers. This breakdown is about 100 times smaller but the actual surface area for the active ingredients increases 1,000,000 times—allowing the solution to deep clean the coat, skin, and into the pore and follicle areas. The active ingredients are small enough to also break down odor molecules and eliminate bacterial microorganisms. Vitamin E, B5, and essential herbal oils are also broken down for maximum absorption. Is It True I Don't Need A Conditioner With RELIQ Shampoo? That is right. You'll be amazed at how soft your dog's coat and skin are after use. This controlled miniaturization which is our Nano Technology, actually maximizes surface area and absorption rates so the effective ingredients can react with ultimate efficiency. As a result of a clean coat with no waxy build-ups, RELIQ shampoos produce a soft, fluffy, and shining coat without additional and unnatural conditioners. RELIQ products are also formulated with far fewer lathering additives. Traditional products attempt to clean fur with harsh additives resulting in further dryness and irritation. RELIQ’s unique science enables our formula to inherently produce very fine lathers with a larger surface area for the ultimate in cleaning. Dead skin cells, dirt, and stains are separated from the hairs and effortlessly rinsed off without unhealthy cleaning agents to leave behind. Your pet will no longer suffer dry skin by the heavy washing with high-lather products. It’s an easier application, quicker clean up, less wasted product, and less water consumption. Can I Use RELIQ For All My Animals? All RELIQ products are safe around children and pets. While made exclusively for pets, there are no harmful ingredients or processes. Our Nano-technology process is calibrated to a minimum size specification preventing penetrating under the skin layers but still maximizing effectiveness on bacteria, yeast, fungus, and other odor & rash causing sources. Because our products work naturally, there are no drugs ingredients in any RELIQ products. Is RELIQ Shampoo Helpful For Skin Problems My Dog Has? In most cases, Yes. Many of our users report how helpful RELIQ is for hotspots, and skin problems. For extreme cases, you should always see your veterinarian but many skin issues can be successfully treated with RELIQ care. How Often Should I Bathe My Dog With RELIQ Shampoo? For dogs suffering from mild itching, scratching, or hot spots: Bath your dog once a week with RELIQ shampoo and use no other non-prescription product. Noticeable improvements should be visible within three weeks (this should be enough for most itching and scratching). We advise against all oatmeal-based products due to possible allergic reactions. Note: For more sever cases, use RELIQ Skin Solution: Bath your pet with RELIQ Shampoo and blow-dry. Shake RELIQ Skin Solution well before applying directly to the problem skin area. Do not rinse off - if desired, gently blow-dry. Apply Skin Solution a second time each day preferably over clean skin. For skin issues on the belly, use a lick-proof collar cone to keep Skin Solution on the affected area. We often see hair loss over the problem area regenerate within one to two months. RELIQ products cleans the skin and then provides a healthy environment for self-repairing on damaged skin. This natural process often takes time. Once the skin irritation is minimized or eliminated, be patient with your pet and let nature naturally repair the skin damage. What Do Dog Owners Say About RELIQ? We have so many happy clients that we request to hear from each one of you! RELIQ wants to see your progress. Send us before & after pictures and we may showcase your success. My coworker used the Pomegranate today on her cocker and it worked great. It's really super at removing flaky skin from these guys. It worked on my boy as well with the skin issues. His skin looks tons better after 2 baths. Where I saw an improvement was immediately with the flaking of Dooley's skin. It was the first bath I gave him 2 weeks ago, when I was drying him there was no flakes. Every time I have bathed him previously, there was flaky skin, redness and bumps. His skin has been like that for several years now. It was so nice to have him not covered with dandruff, and didn't stink.. YIPPEE !!! This is by far the best shampoo I have ever used. I show shelties and schnauzers from time to time so their coat has to be in optimal condition. This shampoo gets right down to the skin and leaves the coat in show condition. Washes them so clean and then leaves a fragrance that stills is there even after a week. If you are looking for a great shampoo, that not only cleans, but will work wonders on a coat and skin, try Reliq. I think you will be pleasantly surprised. Wonderful shampoo! As a professional groomer, this has become my "go to" shampoo. It works on fleas, stinky dog odor, helps to lighten those dark stains dogs get from chewing or water. It leaves the coat soft and makes drying and combing out easier. Can't wait to order more. A miracle deodorizer shampoo for removing cigarette smoke saturated coat. I bought RELIQ products from the groom and kennel expo in Pasadena and I want to write you and let you know how much I loved your product! I have been a professional groomer for 6 years and have tried just about every product... on the market for eliminating cigarette smoke from dogs coats. Just recently I groomed three Pomeranians, whom I groom every three weeks, their owner smokes in the house and the dogs coats are saturated with the scent of cigarette smoke. I used the products I bought from you at the expo and was literally astonished that the smell had been completely eliminated! The toughest thing I have run across is ridding that smoke smell out of dogs coats and I feel like I have found a miracle deodorizer. I am literally in shock over your product and will be ordering and using RELIQ the remainder of my career. Wow! Best product ever! I've been a dog owner for 20 years and now own a Cocker Spaniel and a Bischon. I used the Reliq shampoo and fell in LOVE with this product!!! They feel and smell so good, longer than with any other product. Their coat feels softer and their color is brighter and shinier. I also love that it’s natural and tearless. I won't ever use anything else. I was quite honestly blown away by the difference. I couldn't believe I wouldn't need a conditioner as one of my dog's has very dry skin, but I was "sold" after just one use. This product is so amazing I frequenly use it on my own hair! I recommended it to my sister with a soft coated wheaten who suffered terribly with hot spots, and she was so thrilled that she went right out and bought 8 bottles at HOME GOODS! I have 9 rescue dogs of all shapes, breeds and sizes. I have used so many types of shampoo that I really didn't think there could be one that was so different-- but I was wrong. RELIQ is something you have to try to believe... but I am sold. You will be too. This is a simple and money saving solution with tear free, long term odor control and great for skin. It is simply impossible to find a shampoo like RELIQ anywhere! You no longer need to purchase other unnecessary products like conditioner, facial wash, or oatmeal formulas! Save Water, Save Money and Save the Earth ! You and your dog will love how RELIQ makes them feel and you'll notice a difference right away. You can get 20% OFF your first order on our website by entering coupon code “INFOHORSE” at checkout- or you can find us at AMAZON and other fine retailers. Be sure to ask them to carry RELIQ-- they will love the difference too!